Producer, multi-instrumentalist, singer, songwriter and guitarist Adrian Belew has done it all. For 33 years, he was the frontman, singer and guitarist in the prog rock group King Crimson. He’s released 20 solo albums and worked with acts such as Paul Simon, David Bowie, Talking Heads, Frank Zappa, Laurie Anderson and Nine Inch Nails. 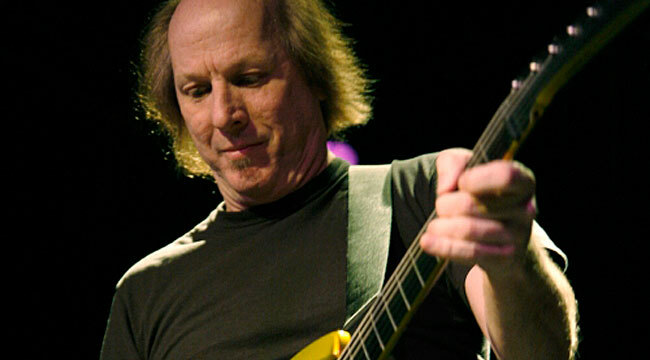 And now he has embarked on a massive tour fronting the Adrian Belew Power Trio, a group that includes bassist Julie Slick and drummer Tobias Ralph. He phoned us from the road. It’s been three years since you’ve toured the United States. What’s been going on? We’ve been touring internationally a lot. We’ve been twice to Europe this year, five weeks each time. We’ve been to Australia. We’ve been to Russian, Japan and South America. The Power Trio has done a lot of international touring. Suddenly, we realized we hadn’t played the United States in a long time. You played on the last Nine Inch Nails album. Talk about what you like about working with Trent Reznor. Whenever I go to work with Trent in the studio it’s very casual and he lets me play whatever I can come up with. He’ll usually put on a track and ask me if I want to do anything. I have four or five things I like to do. I do them and he says he loves it. I leave after three or four days of that and he makes choices about what he’s going to use. When I get the new record, I’m surprised like everybody else. He just called. I know he was a fan of my work with David Bowie. He called my management and I just happened to be in L.A. where he was recording. I didn’t know who NIN was, which is not surprising because I don’t keep up with anybody else’s music much. I have so much going on that I can’t. I hate to say that. I had heard good things about him. My manager said I should give it a try and I did. I loved it and had a good time. I love the sound he gets and the production and the style. It’s really exciting for the kind of guitar playing I do. He turns me loose. Were you disappointed that Robert Fripp didn’t invite you to join the latest Crimson project? Naturally I was disappointed at first to be on the sidelines and not in the parade. Once I realized what it was that they wanted to do though it made perfect sense. They played the material from 1969 to 1974 before I was in the band and rarely touched on anything I did. They didn’t do a single song that I wrote. It didn’t make sense for me to be in the band. Frankly, I was really busy doing solo things and things with my band so it wasn’t a good time. I think the public perception of that band is that all of the players have huge egos. Is that the case? No, not at all. If Robert had asked me to do something and it was new, I might have joined in. Even that process takes two years. But just to do a tour with music I wasn’t involved with didn’t make sense. It didn’t hurt my ego at all. I loved Lone Rhino, your first solo album. What was it like stepping out and doing that first album on your own? I felt fairly confident. I had a good band and I had good engineers. The problem for me personally was that I had waited all my life to do my first record. I had so many ideas and directions. That’s why it’s a very eclectic record. It’s not necessarily a mistake but it generally happens with an artist on their first record. I still think it’s a good record. Was that the first time you put animal noises you made with a guitar on a record? Well, before that, King Crimson had just recorded the Discipline record and I had put an elephant or two in there. And some seagulls too. What is it about you and animals? I’m very much an animal lover. I’m a bird watcher kind of guy. I don’t know why I’m drawn to elephants and rhinos and all the African animals. It’s just something I’ve always loved. I’m a nature lover. Knowing what you know now, would you have changed anything about your solo career or other projects? It seems like you’ve worked with all the right people and made all the right moves. I don’t know about that. I don’t think I would change anything. It’s worked out really well. I’ve done far more than I would have ever dreamed of doing. I’ve played with people I thought I would never even meet. I’ve had some great experiences with bands. I’ve been able to make whatever music I want and have it connect with a certain number of people. I wouldn’t change a thing. The dots connect in a certain way for reasons. If you went back and changed it, it wouldn’t be the same. I’m very happy where I am now. I can do anything I want musically and I still have a thousand ideas. I wanted to write songs. I was a drummer and singing. With my first teen band, we played all the early ’60s music. I loved being a drummer and singer. I could hear songs in my head but I couldn’t explain them to anyone. I didn’t have a tonal instrument. I got sick in junior high school and had to stay home for two months in bed and be tutored. I had mono. It was nothing serious. I borrowed an acoustic guitar from one of the guys in the band and taught myself. At what point did you establish your own sound? I was doing that in the mid-’70s after I had been playing guitar for about nine or ten years, right before Frank Zappa walked in and discovered me in a club in Nashville. I had started putting car horn sounds and seagull sounds into the cover songs we’d play. I could see that people got a kick out of it because you could make your guitar sound like animals. I thought maybe it was a direction that no one else was interested in. In the world of guitars, it’s hard to find your own voice because everything has been done. You’re lucky if you can find your own tiny piece of real estate. I was fortunate to have that happen. Is the electric guitar becoming extinct because of the move toward electronic music? No. I recently read it’s the most popular instrument in the world. I don’t think electronica is going to cancel that. The beautiful thing about guitar — whatever kind of guitar it is and whatever kind of guitar playing you’re doing — is that it’s so expressive. There are so many ways you can use it whether you’re using playing acoustic or using alternate tuning. I use a computer on stage. There are so many different things you can do with it. It’s a perfect voice if you utilize it properly. Talk about your future projects. I have two apps coming out. One is a professional audio processor. It’s for people who like to make crazy wacky sounds. I’ll leave it at that. The one that’s more consumer-oriented is FLUX, which is music that is never the same twice. There are hundred pieces of songs and snippets of music and laughter and sounds that interrupt those moments in song. Every time you press play, you get a half an hour of that stuff. Every time it’s different. It comes with visuals that are changing all the time. You can get info about the track and the lyrics and any back story. For people, who want a more normal experience, you can place it in a playlist and hear it again. It’s a new way of hearing and listening to music. We’re doing it somewhat on this tour with the Power Trio. The response from the audience has been wonderful. They’re getting so much more material and so much more of a show. We play 30 songs and some are truncated and interrupted by these snippets, just like in the app. It happened in 1979 when I was touring with David Bowie in Europe. [In France] I was sitting outside in front of two cafes with their doors open. There were boats, seagulls, laughter and different music coming from each of the cafes. It all made sense to me. This is what music really is. It should sound like life itself. It’s quick and random. It’s all the things that the Internet is now. For years and years, I wanted to make music that way. Four-and-a-half years ago I started recording material toward that end. That’s how I ended up with hundreds of things. You hear the songs sometimes in their full length but mostly in random sections. You do hear the same things over time. It’s like putting together a jigsaw puzzle. The thing that makes this different from any CD before it is that it’s never finished. I can update it and change new music anytime I want and that’s what I intend to do. How does that work in the live show? What I’ve done is to take a section of a song. That’s interrupted by canned laughter and then it goes into the next song and we do something similar with that song. I can go back through my catalog and play music that we never could play before simply because we’re not playing the whole song. There are some pieces we play all the way through, especially some of the heavy hitter improvised music that’s within an instrumental piece. Every now and then you hear something all the way through. The audience is loving it. I’ve gotten great responses about the experience. You get so much more in one show. It’s really surprising, of course.